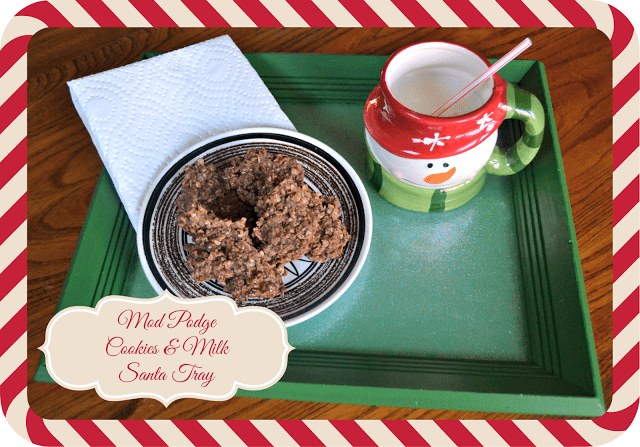 Easily customize your child’s own Cookies & Milk Santa tray with a thrifted frame and some glitter Mod Podge. 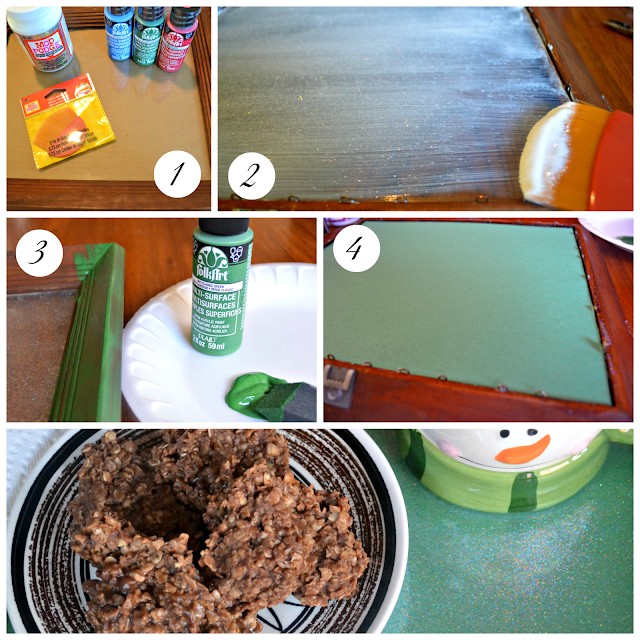 A fun DIY to get your kids crafting this holiday season. Step 2: Remove the frame backing and brush on the Mod Podge straight to the glass. The Glitter Mod Podge does best with several coats. I coated the glass 5 times before I had just the right glitter look. Once your Mod Podge dries you are ready to paint your frame. Step 3: Paint your frame! You can use any color of your choosing but some great colors for Christmas are obviously red and green. I chose to use green. Step 4: Now that your paint is dry you can flip over your frame and place a piece of construction paper behind the Mod Podge and then replace the backing. I found that the paper allowed the glitter to really pop. You can again use the color of your choosing. I wanted to keep it monochromatic and went with green on green. Step 5: This is optional but since you only use the Santa tray one night during the entire season I think it would be fun to either use a dry erase marker or cut vinyl and do a Christmas silhouette on the front of the glass. It would look great with a vignette on the mantel and it can be erased or peeled off for Christmas Eve. We need to make a tray like this! Cute! I want to make one! This is super cute and sounds pretty easy! It is definitely easy and doesn’t take very long at all. Very cute! Love the sparkly green! Love this idea – so cute! I just love Mod Podge! That is so cool! Love that idea! How cute is this? I love it and I LOVE Mod Podge!! Thanks for sharing!! What an ADORABLE tray! You did such a great job!